Many of us have a few ‘special’ bottles in our collections but finding the time to drink them can prove surprisingly tricky. We don’t all have the skills or the space to cook a meal for friends at home, so one solution is to open treasured bottles in a decent restaurant. But with different policies, corkage charges – and with some restaurants refusing outright – what’s the best way to proceed? According to wine writer David Crossley, “once you get used to doing it, you cease to be shy about asking.” I’ve spoken to head sommeliers, restaurant managers, collectors and wine lovers in an attempt to draft the unspoken rules of engagement. “Firstly, definitely call the restaurant ahead of time just to make sure everyone is aware and agrees to the corkage policy,” says James Fryer, Beverage Director at the Woodhead Restaurant Group (Portland, Clipstone, Quality Chop House). “No-one wants to start off the evening with the old ‘are you aware of our corkage policy?’ line.” Everyone I spoke to agrees that calling ahead is the golden rule. And don’t just ask the restaurant if it’s OK to bring a bottle, enquire specifically if there is a corkage fee (i.e. a charge for taking your own wine) and what it is. How much is fair depends on the type of restaurant. 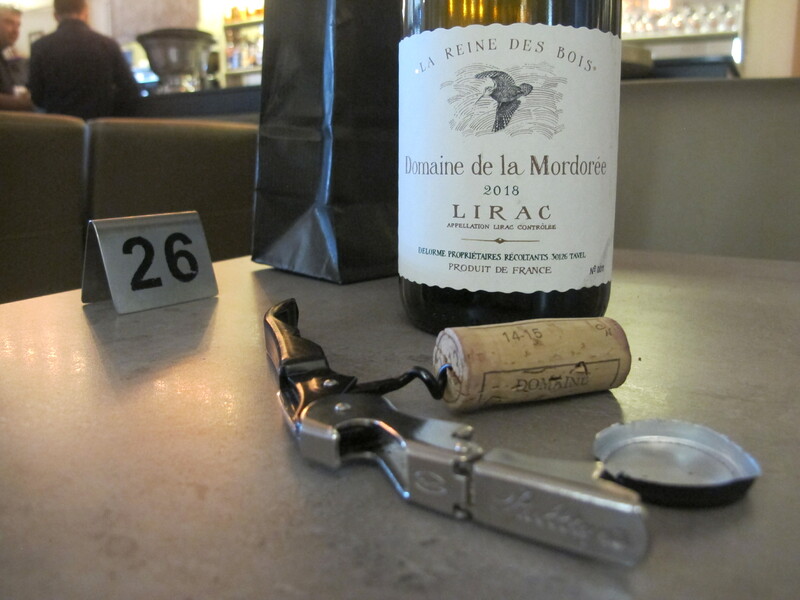 Wine writer Simon Reilly regularly takes wine to restaurants if their wine list is uninspiring or if he’s “meeting up with fellow wine geeks.” He reasons that a corkage charge equal to the cost of the cheapest wine on their wine list is fair. “At least they’ve got an income from booze they are happy with as otherwise it wouldn’t be on the list,” he says. Fees are entirely at the restaurant’s discretion however, and anything from £10 to £30 is common, with some top-end restaurants charging even more. Sparkling wines sometimes attract a premium. It goes without saying that just rocking up to a restaurant with a bottle of ‘value’ supermarket plonk isn’t going to win you any friends. Fryer says “we’re not going to turn anyone away, but it can feel like you’re trying to cheat the system” with a very cheap bottle. Restaurants offer corkage policies so guests can take something special that they happen to own, rather than a way of them saving a few quid. “And special doesn’t mean expensive,” he continues, “just something interesting, something different.” When pushed on what kind of wine might be considered too cheap, he suggested that a retail price equal to the price of the restaurant’s house wine would be a good starting point. With a corkage charge of £25, if you spend less than £15 retail on a bottle of wine, it’s likely to be cheaper to buy the same bottle directly from the restaurant anyway. You might also want to think about the restaurant’s cuisine and how it works with the wine you want to take. If you’ve got a great bottle of Riesling you want to open, it’s more likely to show its best at a fish restaurant rather than a steakhouse. Rémi Cousin is Head Sommelier at Le Gavroche and he suggests checking that the restaurant you’re visiting doesn’t already carry the wine you’re planning to take. “If the restaurant has it on their wine list then I think it is a little ridiculous,” he says. It suggests you’re simply trying to avoid paying the restaurant’s mark-up. The easiest way is to look on their website before booking. The professionals quoted here work at restaurants with serious in-house wine expertise, but smaller local restaurants can be just as uncertain about corkage etiquette as most of their customers. The only places that I’ve encountered that have refused to accept corkage under any circumstances are neighbourhood joints who simply aren’t familiar with the concept. Steve Thomas lives in Islington and works in insurance, and regularly takes bottles to his local Italian. “They let me bring my own wine but have never explicitly asked for a corkage fee,” he says. “I usually give them an additional £10-15 on top of the service charge.” Having to deal with a customer’s own bottle can be nerve-wracking for staff and goes beyond standard service, so it’s good to acknowledge this one way or another. Matt Whitaker is Restaurant Manager at Pompette in Oxford and he’s had “a few customers in the past try the old ‘one magnum equals one bottle’ trick,” he says. If you’re taking a magnum to a restaurant, expect to pay double the standard charge. There are some places you wouldn’t want, or wouldn’t need, to take your own wine. David Crossley suggests places such as Noble Rot, The Remedy or 40 Maltby Street, “places where the wine list is so good that I don’t need to lug wine around all day.” He also points out that some restaurants stock wines that simply aren’t available to buy retail, such as Terroirs near Covent Garden, which occasionally stocks cult Jura producer Domaine des Miroirs. A few years ago, I went to Chez Bruce in Wandsworth. I’d brought a bottle of 1998 Vieux Télégraphe Châteauneuf-du-Pape which I gave to the sommelier on arrival. He offered to decant it for me, and served me a taste at the table to check its condition, like he would with any bottle of wine. “It’s corked,” I said. We stared at each other – he couldn’t offer a replacement because I didn’t order it from their list. Just as well I’d brought another bottle, just in case. It’s worth dropping a backup bottle in your bag – the safety net for the BYO pro.